Please join our live chat at 2pm on March 3rd, with Environmental Commissioner Gord Miller about his report, Smart from Sunrise to Sunset: A Primer on Ontario's Evolving Electricity Grid. ECO Staff: Another one from our twitter followers - Ontario's Independent Electricity System Operator has contracted for 6 megawatts (MW) of energy storage (flywheel and battery). What are we paying and what do we get? ECO Staff: Another question we received on twitter this week - how much money has been spent on implementing the smart grid? They are not the same, but smart meters were an important and necessary first step towards a smart grid. They helped utilities become more comfortable with communications technologies and electronic data management. More importantly, they also helped change the relationship between customers and electric utilities, by making customers more aware of their energy use. Once you know that the cost of your electricity changes depending on the time of use, and once you can visualize and track your electricity use on an hourly basis, you will want more ability to control your energy use and manage your costs. The second generation of smart grid customer products will build on smart meters. ECO Staff: Are smart meters and a smart grid one and the same? 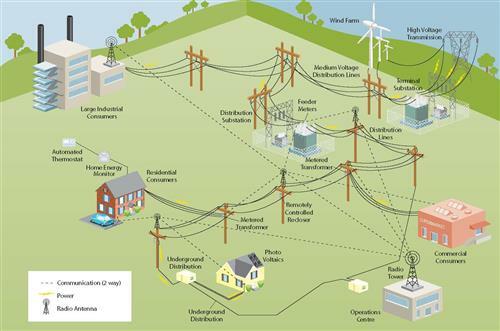 This is what a future smart grid could look like. Spot the difference? This is what our grid looks like now. There is no universal definition, but the key idea behind a “smart grid” is using information and communications technology to make all parts of the electricity system – generation, transmission & distribution, and end use – work better. This includes using technology to reduce the environmental impact of energy use, which is obviously one of the key benefits from our perspective! ECO Staff: What do we mean by a smart grid? 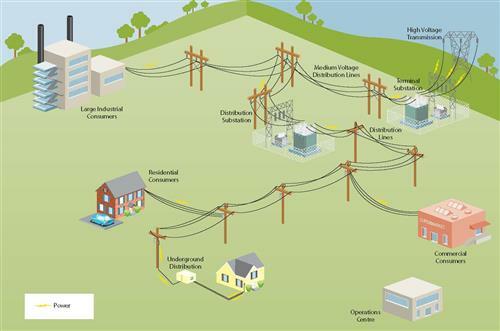 Most people are probably aware of smart meters, but may not know much more than that about the smart grid. Our office released a report last fall: "Smart from Sunrise to Sunset", which is available on our website: bit.ly This report shows a 'day in the life' of the smart grid, and describes six benefits that a fully functioning smart grid can bring. Good afternoon! Thanks for joining me today to discuss the smart grid in Ontario. The Environmental Commissioner of Ontario, Gord Miller, will be here shortly to answer any questions you have about this report and smart grid developments in Ontario. Before we begin, just a quick note to anyone who has already submitted a question through twitter or email (using #OntECOLive or conservation_report@eco.on.ca). We've collected these questions and our ECO Staff will present as many of them as we can to the Commissioner today. However, we may not be able to answer all questions because we only have an hour to discuss the report today. Hi everyone! Welcome to our live chat and thank you for joining us. Today we will discuss Ontario's transition toward a "smart" electricity grid - what it means, and how it may affect you.